Administrative/Biographical HistoryFrank Orban, née Ferenc Ornstein, (b. September 16, 1923, Szeged; d. September 17, 2005, Vancouver) was born into an affluent Jewish family in Hungary. In 1944, his parents, Lipot (b. July 15, 1893 in Felsővist (in Fogaras county, Romania) or Felsőviznice (in Bereg county, Ukraine); d. April 13, 1945, Göstling an der Ybbs, Austria) and Olga Ornstein, née Schwartz (b. October 27, 1893, Novi Sad (Újvidék), Serbia; d. April 13, 1945, Göstling an der Ybbs, Austria), were forced out of their apartment with only a suitcase; they were first sent to the Jewish ghetto in Szeged, a three-block area surrounding the town’s synagogue and school. That same year, Frank Orban, with his friend Peter Szasz, was sent to a forced labour camp in Hungary. Frank’s girlfriend at the time, Eva, was a non-Jewish Hungarian; she kept hidden some of Frank’s family’s possessions, including documents and photographs. Lipot and Olga Ornstein were deported to Göstling an der Ybbs, Austria, in June 1944, and were killed by German soldiers in April, 1945, just as the war was ending. Frank was discharged from forced labour service in July, 1946. Frank changed his last name to Orban on October 28, 1946, while living in Israel, where he spent a few years before moving to Greece. Orban met his wife, Harriet (née Charieliea Vallits), while he was station manager for EI AI Israel Airlines in Athens, Greece, circa 1950. They married in the registrar’s office of the Metropolitan Borough of St. Marylebone, London, in 1954. Frank and Harriet Orban immigrated to Canada circa 1957, when he was hired by Canadian Pacific Airlines as Aircraft Maintenance Engineer, a job he held until 1970. Thereafter, he worked as a chemist in the Engineering Department of Canadian Pacific Airlines until his retirement. Frank was a member of the International Association of Machinists, the Quarter Century in Aviation Club in Vancouver and a volunteer for the Burnaby Museum. He collected aviation pins for over forty years. Orban received the maximum amount of compensation under the law in accordance with the Foundation "Remembrance, Responsibility and the Future," via the Claims Conference program for former slave and forced laborers, in 2004. 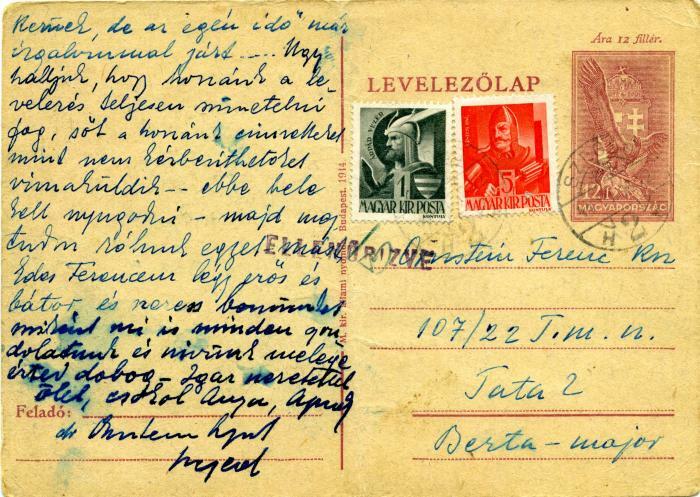 Scope & ContentItem is a postcard from Dr. Lipot Ornstein to his son Frank Orban describing the new room in the ghetto in Szeged, Dr. Lipot's health, the health of his wife, Olga, and their living conditions.